Classic Showcase is pleased to announce the arrival of this elegant Jaguar Mark IV Drop Head Coupe from a significant Jaguar collection. A wonderful example of a bygone era of Jaguar history. One of 266 Mark IV DHC built between 1947-1948, of which only 116 survive today. It was the 5th DHC built after World War II. A professional body off restoration was performed by Jaguar professional, Classic European, from 2013 until 2017. The car has been disassembled, fully documented, and restored using the highest quality parts available. 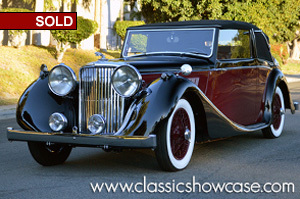 During the restoration process, many unique features were noticed that indicate that this car was one of the early “protypes” in the transition from the prewar “SS” cars to what is known today as the Mark IV. Included in the restoration process, the Mark IV has been body worked, fit, prepared for primer, sealer, paint, base, clear, color sanded and buffed to a fabulous finish. All systems have been gone through, and the engine has been rebuilt back to factory specifications. The fuel, electrical, cooling, and hydraulic systems have been restored as well. The car's mechanical components have been rebuilt accordingly, including the engine, transmission, rear end and suspension. The chrome has been re-plated as needed, and the Mark IV has received a new custom tailored and fit interior. Starting life at the Universal Motor Company in Cairo, Egypt, it was built in December 1947 but was not dispatched until March of 1948, having been diverted from Claparede, Geneva in Switzerland. The first owner was a Mr. C. Salama of Egypt. Then the Jaguar passed on to Mr. William Locke of Lexington, KY until 1983 when she passed hands over to Ronald & Sonja Halbauer in Lawrenceburg, IN who had it for 30 years, showing and driving it extensively. They even noticed Egyptian desert sand in the fender brackets when they were preparing it for shows. In mid-2013 it finally came to rest with its last owners, two renowned Jaguar collectors in La Jolla, CA. • Regional Standings for the JCNA – SW 03 – 1st place – 99.90 pts. As you can see, she is ready to continue the concours circuit, and with that in mind, she comes complete with all her tools, two ignition keys, a battery maintainer, a custom car cover, restoration photos on a thumb drive, two license plates, a copy of the spare parts catalog, and miscellaneous history from the Halbuer’s ownership. The Jaguar Mark IV is a car built by Jaguar from 1945 to 1949. It was a re-launch of a pre-Second World War model made by SS Cars Ltd from 1936. Before the Second World War the name Jaguar was the model name given to the complete range of cars built by SS Cars Ltd. The saloons were titled SS Jaguar 1½ liter, 2½ liter or 3½ liter. The two-seater sports car was titled the SS Jaguar 100 2½ liter or 3½ liter. After the war the company name was changed to Jaguar Cars Ltd. Although the post-war saloons were officially the Jaguar 1½ liter, 2½ liter etc., the term "Mark IV" was sometimes applied retrospectively by the trade to differentiate them from the officially named Mark V. Only six-cylinder models were officially sent to America, and these early offerings, quickly gained a following, especially when they were first offered with left-hand drive during 1947. The 125 hp, 3.5-liter OHV six-cylinder engine offered ample power and torque for American tastes, while the large Lucas P100 headlights and upright grille of the Mark IV were welcome reminders of a more elegant, coach built past. All the cars were built on a separate chassis frame with suspension by semi-elliptic leaf springs front and rear.